After being a major contender for #VOTY18 – making it all the way to the finals – I can now relax and enjoy the 2019 Volkswagen Jetta for its merits. If you have not following this website, let me re-introduce to you to the new MkVII Jetta. This Jetta represents a sedan that has been around for almost 40 years. Built off of the MkI Golf (which we call the Rabbit), the three-box Jetta started a new trend of sedan versions of popular front-drive compact hatchbacks in Europe. However, its biggest success was right here in North America, where the Jetta continues to be the volume seller for Volkswagen. In a nutshell, the Jetta has bucked the SUV trend, despite Volkswagen offering two of the best in the marketplace – the Atlas and Tiguan. The Jetta that was nominated for #VOTY18 was the top-of-the-line SEL Premium model. 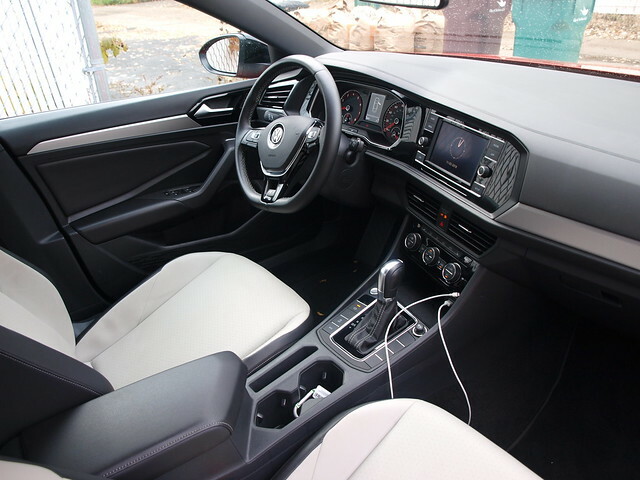 It came with every bell and whistle you could think of – Digital Cockpit, all of the Driver Assistance features Volkswagen can cram into it, full leather seating, the 8-inch touchscreen version of its Car-Net supported infotainment system and a few more luxury features. For this second go-round with the Jetta, I received the R-Line model. It sits in the middle of its current five-trim level lineup as the sporty model for younger customers – and those who are young at heart. The R-Line offers a blacked-out grille up front with fog lamps, with a two-tone leatherette upholstery and really sweet looking 17-inch alloy wheels. This is a great package if you’re looking for a car that is simply fun. In the R-Line, I am missing a lot of the SEL Premium’s goodies. My 8-inch screen has been reduced to 6.5-inches. I do get a backup camera with rear traffic alert, blind spot monitoring, forward collision warning with autonomous braking – and that’s it. No adaptive cruise, lane warning, and so forth. Instead of full TFT screen instrumentation, I get standard issue dials and a smaller information screen. This brings up a very important question. Can someone who is used to all of the luxuries in life live without them in a fun package, such as the Jetta R-Line? The answer stems from a very important point: instead of focusing on what’s on the car or not, why not look at what each one of them share across the board? For starters, it does share a lot of the great things that every 2019 Jetta has to offer. The sharp styling that melds a bit of Audi onto a new generation Volkswagen design language. It may not light everyone with excitement, but it has transformed the Jetta into a stylish sedan for its class and price point. We need more of these kinds of cars out there in the marketplace. 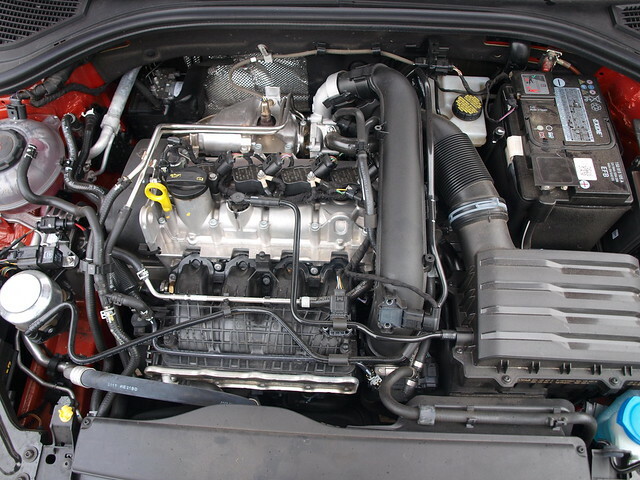 The 1.4-liter turbocharged TSI four-cylinder engine is a fun motor. It loves to be motivated when encouraged to do so. The 147 horsepower number is a bit low for some people, but it is the 184 pound-feet of torque that you should pay attention to. 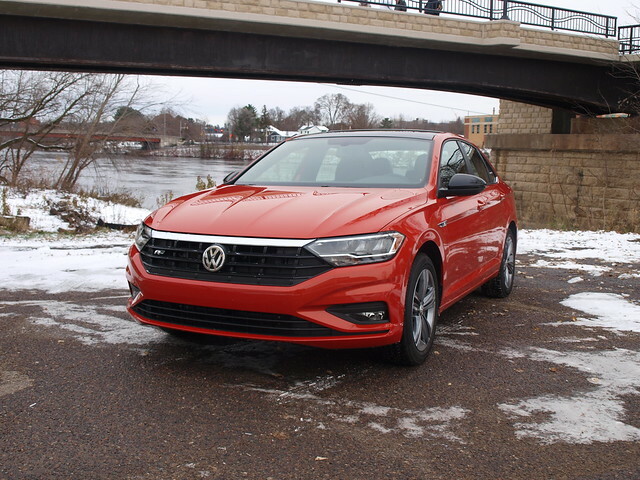 Having that much low-end power makes the difference between a typical compact sedan and the 2019 Jetta. It also helps to have the new 8-speed automatic transmission attached to the 1.4-liter TSI turbo. Not only does it work well with the low end, but it can also shift rather quickly through the ratios for a smoother cruise on the highway. The short shifter helped when I needed some manual adjustment between shifts. You won’t find any paddle shifters on this Jetta R-Line. It is also very economical, too. For this time around, I averaged 37.6 MPG. That is still very good for a car in its class. You will read this phrase a lot in this review – if you have not done so already – it is fun to drive. Without having to rely on adaptive cruise or any advanced driver assistance features, you can play with the Jetta a lot freely. The driver has been given command of a compact sedan that can be flung on the highway without any resistance. The suspension has a bit of softness in it, so be careful on the corners. It tracks and corners well, but you will find the limit rather quickly if you come in too hot into them. The steering system is solid with a good turning radius and nice feedback from the wheel. It could use a bit more system weight, but I could be wanting more of a GLI than an R-Line at this point. The brakes are solid, with great pedal feel and feedback. It also does a great job in normal, panic, and winter stops. You read the last phrase right – winter. While the Jetta R-Line was in my care, winter decided to show up. First, it was a thick dusting of snow. Then, the temperatures dropped through the floor. Not to be dramatic, but I was not expecting this. Rather, I was wishing against it. 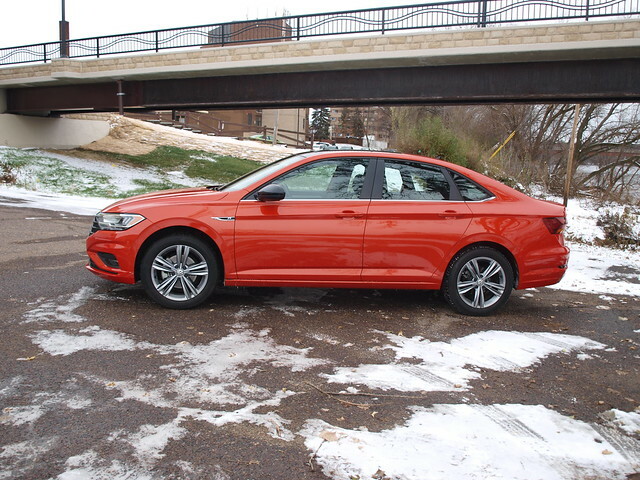 The early onset of winter did change a few points about the Jetta – while easing some concerns I had in advance about it. I feared that the Bridgestone Ecopia tires would not provide enough traction on caked sections of roadway. I also feared that my braking would be compromised if I made the wrong decision and stopped the car later than sooner. Sadly, Minnesotans have this pseudo-amnesia when it comes to the first snow of the season. We often forget that the change in the weather means taking a bit more caution on the roads than usual. You cannot act like you’re the kind of the highway and go at above normal speeds to beat the crowd. Nor can you too cautious to slow everyone down behind you. Driver competency comes into question – especially when 115 crashes were reported on Minnesota highways during the first morning after the snow fell overnight. With that said, the Jetta R-Line held its own. I have rambled on about how the Jetta R-Line handled the first days of winter-like weather in the middle of fall. I better tell you about the interior – and the Habanero Orange paint job. The two-tone leatherette upholstery held its own with its mix of luxury and durability. The seats were supportive for the long drives, as well as short shags across town. The heated seats also were a huge help when the temperatures began to bottom out. I found myself taking too much room behind the steering wheel. It was a sacrifice to get comfortable in doing the mix of long and short hauls to stretch the manually adjustable seats to where I need them. Luckily, no one was sitting behind me. If they were my size – forget it. However, you can fit four average-sized adults and a child inside the Jetta’s cabin. A huge win is the trunk space. The best attribute in the new Jetta is that it maintains having one of the largest trunks in its class. With long cargo, a seat release inside the trunk will expand cargo space for longer items. For example, a new ironing board to replace the ratty 12-year-old one that has survived two homes in my care. 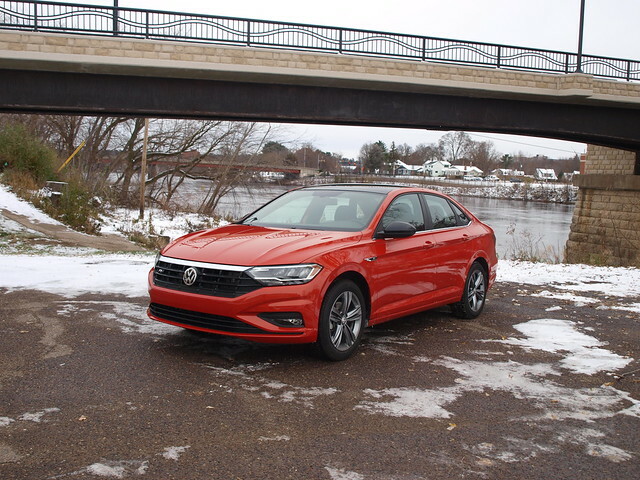 In the previous review, I already talked about pricing for the 2019 Jetta – which has not changed one cent since (starting at $18,545, in case you missed it). This R-Line tester came to $24,140 – a decent value considering the segment these days. 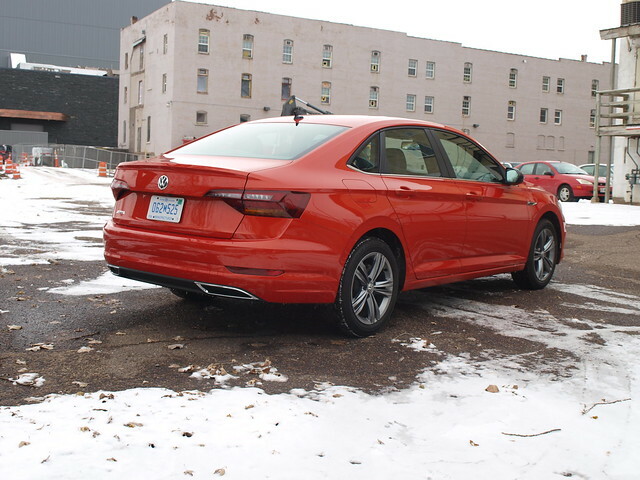 This second go-round with the 2019 Volkswagen Jetta prompted a few questions between the two testers I worked within a timeframe of just over two months. The SEL Premium represents a fully-loaded Jetta with all of the technology, safety, and upmarket ambition that customers are willing to pay for – almost $28,000 worth. The R-Line sits in the middle with its balance of sportiness and fun-to-drive abilities, without all of the tech goodies found for $3,600 more. Let’s look at the other end of the Jetta spectrum – the S model. For about $20,185, you can get a manual version with the Driver Assistance Package in Habanero Orange with standard features such as App-Connect (i.e. smartphone integration) and you can spend a bit more on tires, wheels, some other modifications…and still get a manual transmission! 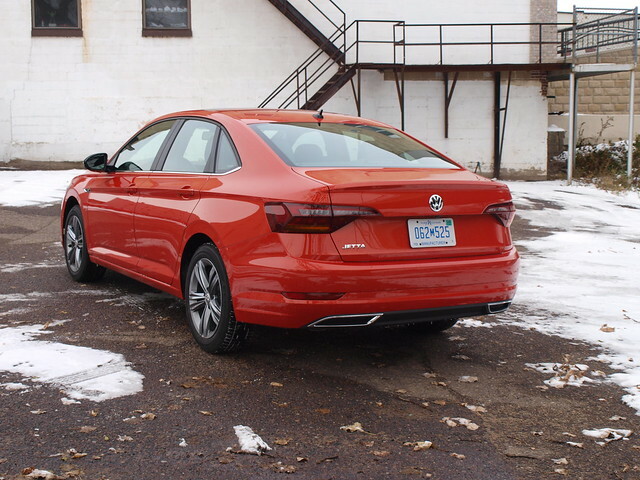 The thing about the 2019 Volkswagen Jetta is how much this car has improved over the past several generations. It is where it needs to be – out front. As for its run in #VOTY18…it’ll be back for #VOTY19!